The Madison Park Levine 4 Piece Tailored Bedspread Set provides a luxurious transitional update to your bedroom decor. This oversized ivory bedspread set features a diamond quilting pattern and a button trim that adds a charm and dimension to the bedding set. Matching shams mirror the design of the bedspread for a fully coordinated look, while a decorative pillow provides the finishing touch. Made from 100-percent cotton percale, this beadspread has a 24-inch drop and is tailored to create an elegant and fitted look. 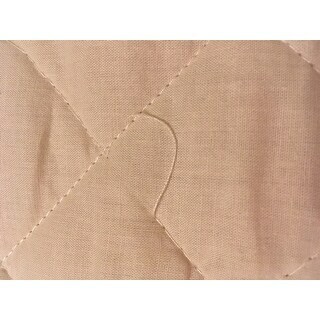 I liked the color and the buttoned corners on the Madison Park bedspread but there are areas where the stitching of the quilting is missing with threads hanging. Also, the edging around the bottom hangs wavy. I will be returning. I love the traditional yet formal look of this bedspread. It reminds me of a wedding dress with the upholstered buttons. The only negative I can think of is that Overstock's prices are usually higher than I want to pay. I would rather pay $100 for 2 or 3 items that I can change whenever I get the urge than to pay $100 for 1 item. That's just me. I change my decor a lot. I am so happy I ordered this bedspread set. I have been searching for something neutral for our rattan headboard. The set is perfect. It does run a little wide, but I read someone else's review that said it will shrink when washed. It is a great weight for Arizona! This is exactly as pictured, I absolutely love it. It fits like a glove, looks and feels like a quality bedspread. It is definitely light weight, perfect for summer. I like it so much I will order another one for my guest bedroom. This bedspread is classic and detailed. I love the padded buttons which gives the bedspread that tailored look. This bedspread fits my queen size mattress perfectly! I was afraid that I would have to make the bed really tight in order for the blanket outline not to show but the bedspread covers and makes the bed look sleek and neat but also cozy. Very nice material too. This is a beautiful bedspread. It fits exactly as described. Gives the bed a tailored look, which gives the bedroom a clean uncluttered look. Just received. Can't wait to wash and put it on my bed. Looks so luxurious! EDIT: before I could wash, I decided to see how it looked. UNFORTUNATELY it hangs off the side of the bed and looks ridiculous. Overstock will not stand by their product. They refuse to return at the cost paid for an item that is falsely advertised as fitting a Cal-King bed. This decision alone will make it very easy for me to not shop Overstock again and stick 100% with Amazon. Didn't like the color. Described as ivory but was more like a dingy drab beige. Sent it back right away. Its not the best quality especially for the price you pay. the full/queen fit my queen bed very nicely. would have rated it higher but the one corner was missing 4 buttons and since I don't have time for returning at this time I opt to sew new buttons on myself. The other is the smell of the spread is awful when you take out of the bag. But a rinse in wool lite worked. 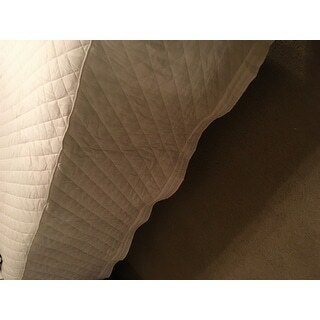 I wondered how a quilt that was fitted could fit full/queen beds. I put this in the wash to see if it would shrink. I also dryed it in the dryer. It did shrink a little. It still fits my full sized bed a little big in width. It may shrink more the next wash it. I am hoping sit does. I liked everything else about it. It comes out of the wash smooth. Soft and comfortable. The color mixes with all shades: white to natural quite well. It is a light tan. I like the look. I love this. I put it on a bed and added pillows to give it a daybed look in the guest room. The size is nice. Big enough to put a heavy blanket under but snug enough to look fitted. Cheap material and I’ve had to sew almost all of the buttons back on. But the style is nice. I liked the bedding however in the description it state full/queen, I have a full size and it was too big, it would fit a queen fine. What a cool design! Love how the corners button closed and creates a very tailored look. Only wish the fabric was a little higher quality. Has the feel of a very loose weave muslin. "How long are the sides? Do they touch the floor? If so, what’s the measurement from top of the mattress to where the spread touched the floor?? The description says 24”. That’s not long enough unless your mattress is on the floor!! " Dimensions are 61"W x81"L + 24"D. I hope it helps. Like the tailored look of it.